A weekly newspaper has been cancelled this week’s edition after a fire at the office where it is produced. The West Somerset News-Trader has not been released this week after the fire at the West Somerset Free Press’s head office. Firefighters spent several hours tackling the blaze and contained it to three of the offices in Williton, which hit a reception area and advertisement sales office on the ground was hit, as well as a meeting room and the adjoining editor’s office on the first floor. Journalists were left with no power, telephones or computers, and properties in the village centre were without electricity for several hours after the fire, in the early hours of Monday morning. 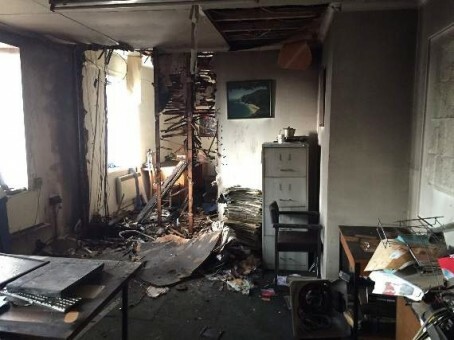 West Somerset Council provided some temporary office space for journalists on Monday to test computers which survived the fire, and have since relocated to the offices of Tindle sister title the Wellington Weekly News. A small production department has been set up at the newspaper’s branch office in Minehead, where its advertisement sales staff are also working from. Editor Gareth Purcell said: “We are indebted to our local firefighters for the job they did in preventing a bad situation from being even worse. Nasty business, I hope you all get back on your feet soon and back to writing the news rather than being the news.